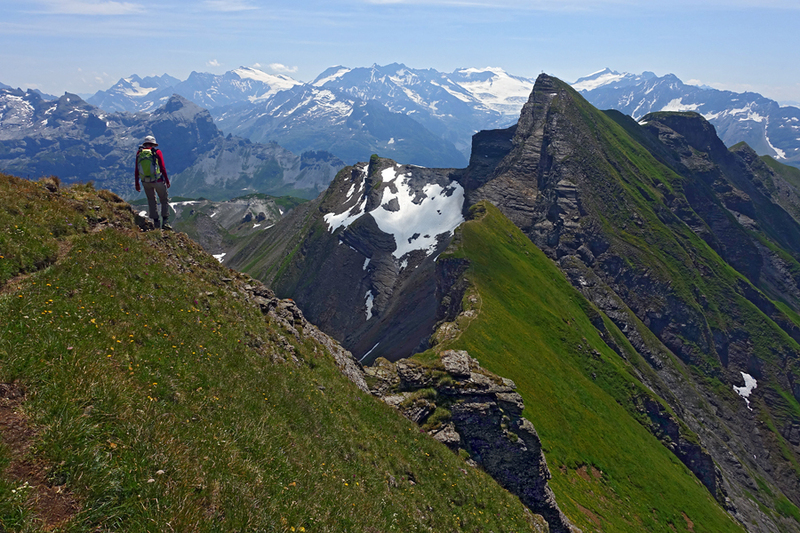 The ridge that runs above Melchsee-Frutt, described in one of our "more interesting hikes" books, has been on the list for a while, today we took advantage of a great-weather day to actually do it. From the gondola station at Melchsee-Frutt we, along with a bunch of other people, follow the signs for Abgschütz (this is the way we came down from the trip with Yvonne) and then turn to follow the trail to the Hochstollen. Despite noticing that we've done a fair amount lately (tired legs!) we make good time and are up top in 1:45. As expected on such a great day, there are plenty of other people underway. 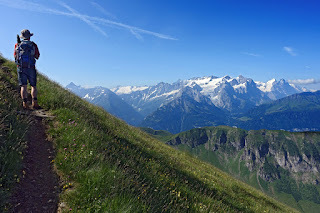 The views are really spectacular: we can see the Berner Alpen (including Dossen, Ränfenhorn, and Hubelhorn from last week), Titlis, the Gross Spannort, the area around the Tierberglihütte, the Trift glacier, etc. After a very short break at the peak we follow the trail (still red-white) further along the ridge and down until we meet the blue-white trail coming in from the left at Hohsträss. This takes us back to the ridge which we follow towards the lift station under Glogghüs. Shortly before getting there we stop for a food break and to appreciate the views while sitting still. Now we start to get into the blue-white part of the tour. The route up to the Glogghüs includes some nice scrambling (with a convenient, and new looking, cable there for people coming down) and is great fun. Of course we aren't alone: it's way too nice of a ridge to have it all to ourselves, but it's certainly nothing like crowded. We both remark on the contrast in the quality of the rock to the ridge we took to the Gaeltehore: it's so nice to have things be stable and solid! From the Glogghüs we head steeply down into the saddle before the Rothorn (you have to go down in order to go up!). This is one of those fun "look at the other side of the saddle and figure out how you're supposed to get up the other side" stretches: for most of the way down it really does look like the other side is just vertical. 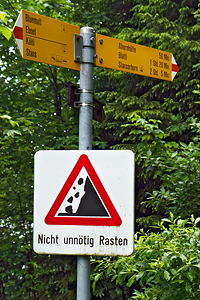 Of course it's not; the trail continues, helped at times with cables, steeply up the other side to the Rothorn. Another short break and then we continue a bit along the ridge before realizing we've made a mistake. Back towards the Rothorn we go and then off along the ridge to the East towards the Talistock to start the descent back to Melchsee-Frutt. The route down is also a nice blue-white path (easier than above) that takes us down, down, down to the red-white trail running between the Balmeregghorn and the Melchsee. Down further to the lake itself and then around (oh the crowds! ), past all of the tourist silliness, to the gondola station and the trip back home.